Roll out tinted gum paste and cut blossoms using second smallest (2 1/2 in.) blossom cookie cutter. For full-bloom yellow blossom, this will be bottom row of petals; cut top row using smallest (1 1/2 in.) blossom cookie cutter. Using craft knife, cut between all petal divisions to 3/4 in. deep. Place flowers on foam and use ball tool from confectionery tool set to thin and fan out petals. Let dry in cornstarch-dusted Mini Ball Pan. For full-bloom yellow blossom, attach top and bottom rows of petals with brush dipped in water. For centers of solid rose and full-bloom blossoms, cut a 5/8 in. wide x 5 in. long strip of tinted gum paste. Roll up strip in four complete turns, pinching at bottom and trimming excess with each turn. For center of Flower #3, roll a 3/4 in. of rose-tinted gum paste. 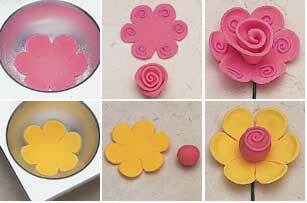 Attach centers to flowers with gum paste. Using royal icing, pipe tip 2 swirls on solid rose petals and center of yellow/rose blossom. Using gum paste, attach centers to flowers and flowers to wire wrapped in florist tape.